This is my mom’s take on a popular Beijing street food–jianbing. 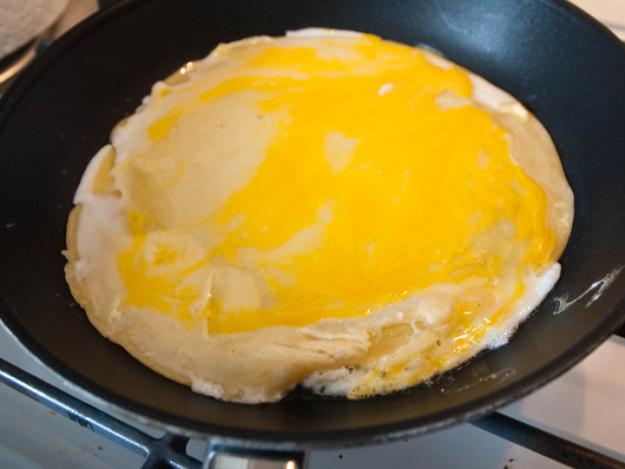 When made by street vendors on top of a flat circular hot plate, it’s a thin eggy pancake that you fold up like an European crepe. Toppings depend on your preference, but it's typically filled with salty and spicy flavors, as well as crunchy textures from fresh scallions, cilantro, and chopped Chinese crullers. You can make this version at home with the help of a few different types of flour to get that soft, chewy and slightly crispy texture that's so addictive. 1. 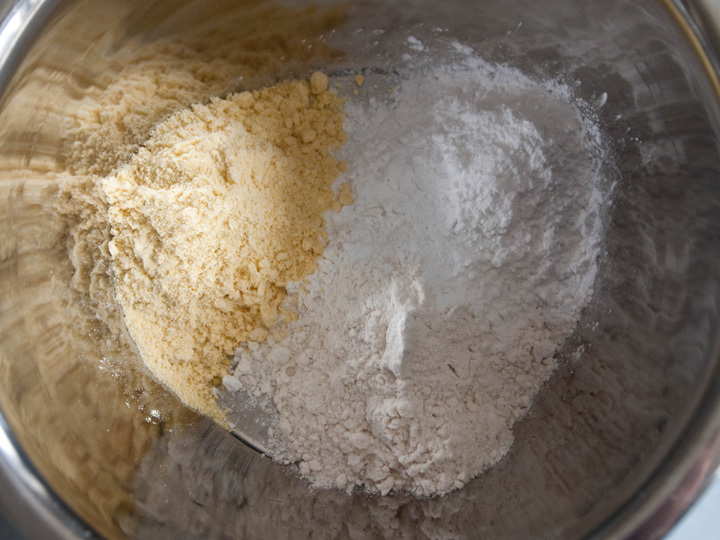 Measure out the all-purpose flour, corn flour and the mung bean starch. Mix together with a small quantity of water to the consistency of a whisked egg. 2. Heat up the oil over medium heat in a non-stick skillet and pour in the batter. After 2 minutes, crack an egg on top. Break up the egg gently and spread around and let it cook for another minute. 3. Flip over for 2 minutes (egg side down). And flip back (egg side up) for another 2-3 minutes until the bottom becomes a toasty golden brown. 4. Serve on a plate with the egg side up. Thinly spread red pepper paste and red fermented bean curd paste. Sprinkle chopped scallions and cilantro on top. Adjust condiments to your liking. Enjoy as is, fold in half or roll it up.